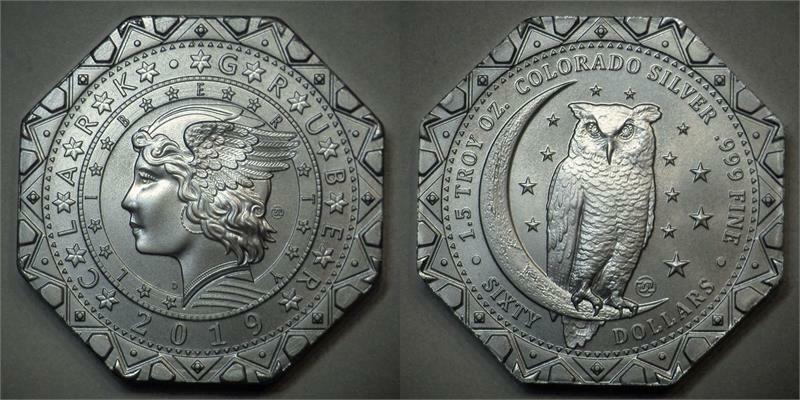 Home > Clark Gruber & Bullion > 2019 Clark Gruber "$60" OCTAGON OWL, 999 Colorado Silver, 1.5 Troy oz. As of August 2013, Moonlight Mint is also officially doing business in the state of Colorado under the registered name “Clark Gruber & Company”. The internet domains “Clark-Gruber.com” and “ClarkGruber.com” now point to www.MoonlightMint.com. The firm of Clark Gruber & Co. established operations in Denver during the Colorado Gold Rush. Beginning in 1860, Clark Gruber began converting miner’s gold into coins which were readily accepted and circulated locally in the Denver area and beyond. The firm was so well-respected that the US Government bought them out in the mid-1860s, first running the operation as an assay office and then eventually converting it into the Denver Mint. In an ironic twist, in 2001 the Denver Mint sold one of their surplus Grabener coin presses which became a core asset of Moonlight Mint in 2008, and now a reanimated Clark Gruber & Company. Clark Gruber coins are today highly-prized by collectors for their rarity and history. The tradition of Clark Gruber continues on. 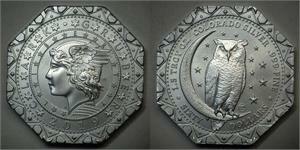 Concept, design, sculpting, engraving, and minting by Daniel Carr and Clark Gruber & Co. Struck using a US Denver Mint surplus coin press.